Sir, – I take issue with Matt O’Keefe on agriculture and climate change (Letters, July 11th). Without attribution or reference, he asserts that, “Our contribution to climate change mitigation is already significant and significantly ahead of many of our peers”. To the contrary though, according to the 2015 Emission Projections from the Environmental Protection Agency, total emissions from cattle-dominated Irish agriculture are increasing, and, based on figures provided by Teagasc to the EPA, emissions will at best ‘flat-line’ to 2035, and probably likewise to 2050. Increasing, or even ‘flat-lining’, emissions is not mitigation; as the Intergovernmental Panel on Climate Change states, sustained and substantial decreases in greenhouse gas flows will be required to limit climate change. As Mr. O’Keefe seems to agree, agriculture must play its part. Confusingly though, the Department of Agriculture, Teagasc, Bord Bia and agri-businesses repeatedly point to ‘efficiency’, the emissions rate per kilo of beef or litre of milk, as a key measure for climate action. This is deeply misleading. Agricultural emissions are in fact, of course, the product of this 'efficiency rate' and total output; and as long as output growth matches (or exceeds) improvements in efficiency, then there is no net mitigation whatsoever. ‘Total emissions from Irish agriculture’ is the only “footprint” that matters in trapping more reflected solar energy. By this measure, the EPA Projections clearly show that under current policies no net mitigation at all is being achieved, and livestock farming under planned policy will achieve none either. If the much-vaunted ‘climate efficiency’ of Irish cattle is to be realised, or ‘emissions leakage’ avoided, agricultural emissions, both imports and exports, have to be costed within a capped emissions budget (national or international) so that polluters pay for emissions and fund a low carbon transition. Otherwise ‘efficiency’ and ‘flatlining’ are just Orwellian doublespeak words being used as a cover for inaction. Maintaining or increasing livestock production (that will thereby limit or decrease global crop production) is not ‘climate smart’. There is indeed an inherent tension between the climate change challenge and global food security. Unfortunately, the inconvenient biological fact – for milk drinkers like myself included – is that cattle-based farming is high emissions agriculture that necessarily exacerbates global climate risks. The resolution – the only honest one – is to admit the pollution damage of ruminant production and support our cattle-farmers and rural communities in a rapid transition to more resilient land use through forestry, renewable energy and low carbon agriculture. Political failure in Ireland’s climate planning means that, as currently forecast, agriculture will take nearly the whole pie of national emissions by 2050 with nothing left for anything else. For all our futures and for future generations, we have to set a different course to a near-zero carbon future, starting now. We are not doing it. We still can – but the window for effective action is rapidly closing. Our Choice: Rocket to a Warming Catastrophe or Turn Down the Jets? We live in an astonishing times. We can predict the future. In one ever-increasingly certain area of knowledge – the overall global trend of climate and its relation to carbon emissions – we now know what is happening and where we are headed. More emissions will lead to more global warming, a warming to temperatures beyond anything humans have experienced in our species' entire existence. What is more, the most up-to-the-minute science, reconstructing the Earth's average surface temperature over the past 20,000 years, shows how massively humanity's recent intensive use of fossil fuels has disturbed the world's climate. If we do act fast to lower global emissions radically, by beginning massive and immediate actions now, by altering personal behaviour, and rapidly decarbonising energy, goods and services, we really can have a limiting effect on future temperatures. If humanity does not act and emissions continue unabated, the climate will pass through temperature level "trapdoors" that will be irreversible for a thousand years or more. [T]he decade 2000-2009 has probably not exceeded the warmest temperatures of the early Holocene, but is warmer than ~75% of all temperatures during the Holocene. In contrast, the decade 1900-1909 was cooler than~95% of the Holocene. Therefore, we conclude that global temperature has risen from near the coldest to the warmest levels of the Holocene in the past century. 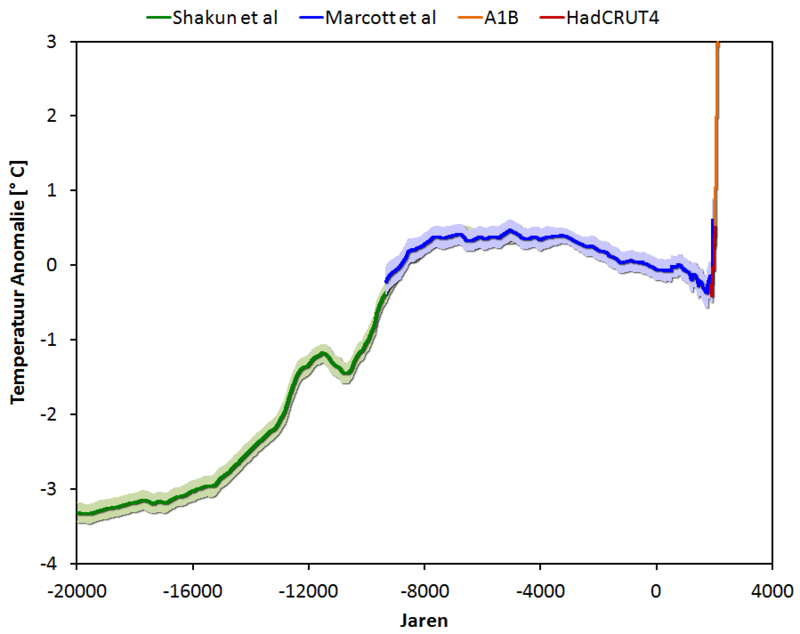 Jos Hagelaars, here, has combined temperature reconstructions for the past 22,000 years, including the recent one from Marcott et al., with temperature records for the past 120 years, and with the emission path that humanity is now following – which is tracking the very worst emissions scenario envisaged by the Intergovernmental Panel on Climate Change. Holgaars' presentation is as below and makes the recent century's change compared to the past very clear indeed. The extraordinary rate of change now being seen is unprecedented in tens of thousands of years of human history and pre-history. Jos Holgaars' presentation of temperature reconstructions, recent temperature, and IPCC forecast. 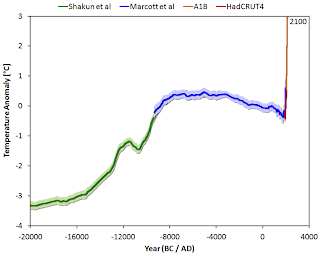 After a long slow cooling in temperature from about five thousand years ago, the recent increased use of fossil fuels, especially from 1900 onward, has launched global temperature upward at an unprecedented rate (as shown at the most recent part of the blue line), a rate that will continue (as shown in red) if emissions continue. This warming will not be continuous and warming will not occur evenly around the world, but it will happen. It has already begun to show the first damaging effects in the increasing weather extremes and weather event intensities. To give a sense of where humanity's rocket launch into higher temperatures is taking us we can look to the past. In the Permian extinction of 251 million years ago, 95% of all species on Earth were eliminated due to a global warming of 6ºC, in that case naturally caused, probably by volcanic eruptions. Corresponding to the currently forecast 'business-as-usual' emissions, our current path, the resultant amount of warming by the end of this century is very likely to be around 6ºC in only ninety years from now. This warming is a result of human interference in Earth's biosphere, the sudden addition of massive amounts of carbon dioxide and methane from burning of fossil fuels with additions from agriculture and clearing forests. If ever there was a time for precautionary action it is now, while it is still possible to act. Science also shows that urgent reductions in emissions could limit warming to a far safer, though still dangerous, level of 2º to 3ºC. "Dangerous" is far preferable to catastrophic. 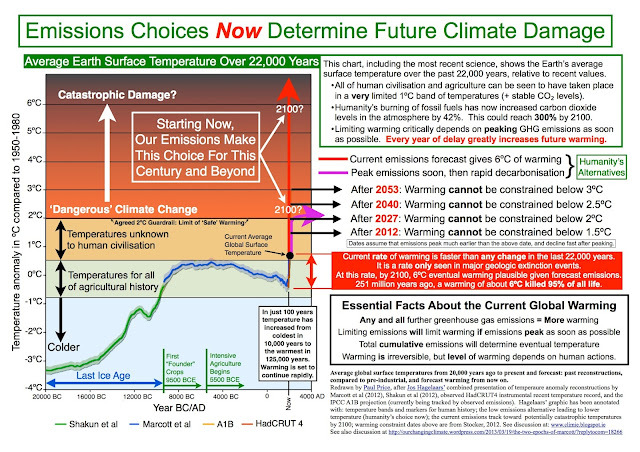 Only the choices we, as an intelligent species, make right now in the light of this information, will determine the level at which warming stops. Humanity, collectively, will have to act fast but it is still possible to limit the warming, if and only if we can reduce emissions very rapidly. Mitigating (reducing) emissions is a far safer and more certain course than geoengineering which has very unpredictable and very uncertain, often short-lived outcomes. Below, I have added temperature bands to Holgaars' temperature anomaly versus time graph, to emphasise how different the future is likely to be compared to the past. I have added date markers for agriculture to show how all of recent human history has occurred within a very narrow temperature (with a constant CO2 level close to 280 ppm). By the end of this century the CO2 level is likely to be three times as great pushing temperatures ever upward. We are heading up to higher temperatures than mankind has ever experienced as a species or as a global civilisation. We now know this with certainty. In sum, the remaining uncertainties are not reassuring and many of them such as methane from melting permafrost are likely to add to the warming once they begin in earnest as global temperatures reach tipping points. Therefore, the humans who live now, we ourselves, can choose to add greenhouse gases to the atmosphere, at current, large and also increasing future rates, thereby knowingly choosing an apocalyptic future of climate extremes outside anything we have known before. Or we can choose to act. Either way, humanity and we individually are making a decision right now by our actions: to do nothing or to do something. To date, despite much talk, nothing has been achieved. Global emissions have doubled since 1990 and they continue to increase because nation states have not peaked emissions, quite the reverse. They have been dishonest brokers in addressing the problem (see previous post). Starting this year every nation has to start by being honest about the warning our science is giving us. At this point we have to peak emissions urgently, even if it costs economic growth. Whatever fossil fuelled, economic growth could be achieved over the next few decades will be undermined by economic decay and possible collapse due to climate damage caused by fossil fuelled, economic growth that could be achieved over the next few decades. We are loading the dice and nature will keep on rolling them. WE HAVE TO ACT NOW! It is our emissions now that are adding to warming. By lowering emissions now – rapidly, globally, politically, corporately, nationally, regionally, locally, personally – we can still change the future to limit warming. Anyone unaware of this needs to become aware of it. Anyone aware of the warnings needs to act on them. Currently, rich nations, businesses and individuals are acting as though their own future is not in doubt and that 'business as usual' is possible into the far future. The rich need to finally realise that we really are all in this together. The futures of their nations, their businesses, their shareholdings, and their children are also in doubt if they do not choose to act for a safer long-term outcome by lowering emissions urgently and radically. We really do have a choice. We can still make the right one. How Could an Effective Climate Financial Mechanism Work? A Cunning Plan! Contrary to all advice that they must not, and contrary to the declared intentions of the globes's nations, world emissions continue to escalate. The scientific advice is strong: if taken globally on average emissions must peak as soon as possible and decline rapidly thereafter. However, all the rich 'Annex 1' countries have agreed (see UNFCCC and 2009 Copenhagen Accord) to act in accord with equity meaning they have the responsibility and capacity to act sooner and faster to allow longer before peak and more emissions to support the development of poorer developing nations. Anderson and Bows have shown how equitable division scenarios of the remaining 2ºC budget among Annex 1 and Non-Annex 1 affect the peaking and subsequent decarbonisation pathways for each. It is clear from this research that there is very little carbon budget left for rich countries meaning that they will have have to pay the poorer countries for some of their potential budget thereby funding poorer countries to move to low-carbon energy and avoid fossil fuelled emissions. Economic growth continues to be largely dependent on activities that lead more consumption and investment in activities leading to more carbon emissions. How then can growth be decoupled from emissions and how can poorer countries continue development for the poorest? Currently emissions are measured on a domestic output basis. The richest countries particularly are effectively avoiding counting the emissions due to their net excess consumption of goods and services, as well as the aviation and shipping they are responsible for. High carbon manufacturing has been exported from rich countries so that poorer countries have become responsible for the emissions and rich countries can buy the cheap goods having 'leaked' the emissions to the poorer ones. For example, in net terms around 40% of China's emissions belong to industrialised countries through imports. Aviation and shipping emissions are not even counted in the figures. In the UK, Dieter Helm has researched and exposed the huge level of accounting problems and difficulties showing that although domestic emissions have dropped by over 20% since 1990, consumption emissions have gone up. The EU boasts that it will achieve a 20% cut in emissions relative to 1990 by 2020 yet consumption emissions are currently only 4% lower and are heading again in the wrong direction. Meanwhile talks in the UNFCCC appear to be endlessly bogged down in complexity. What's needed is a cunning plan. This post imagines a possible simple regime to illustrate how linking the responsibility-cost for emissions with the need for decarbonisation and development could be managed, especially with regard to equity of development. The key element of this imagined regime is to avoid complexity and keep it simple. To start, this regime ignores the developed countries' past emissions, letting them off the hook, and instead focuses on emissions from now on. Any regime needs to penalise the hidden damages of greenhouse gas pollution by charging the consumers of the goods and services that caused them, and then needs to transfer funds to decarbonisation and development (especially in poorer countries). We know from global statistics and from personal experience that money enables us to consume goods and services and therefore to cause GHG emissions. CO2 emissions and total economic output (annual GDP) are strongly related. A country is free to spend its income on more emissions. Personally the situation is similar, if we save hundreds of euro in fuel costs after we insulate our house we might well decide to spend the savings on a holiday flight, burning even more CO2 than had been saved. Without charging for these emissions there can be no doubt that emissions will continue to escalate as national and average incomes increase. Money enables the holder to buy the right to create emissions. However, the damage caused by emissions is global no matter where the emissions are created. Therefore the imagined simple regime might charge for emissions on the basis of GDP and distribute the collected monies according to population to balance equity in development. The cost of GHG pollution could be set at the social cost of carbon (the SCC), for which the Stern Review used an estimate of $30 per tCO2 although many authorities consider it to be much higher, in the range of $100/tCO2. Global emissions in 2011 were 34 billion tons of CO2. Therefore with an SCC of $30/tCO2 the cost of all emissions would have been $1,020 billion and at $100/tCO2 the cost of all emissions would have been $3,400 billion. So how does this work in practice. Every country pays a fee for carbon emissions based on its GDP as a proportion of world GDP multiplied by the cost of all global emissions. Every country receives a dividend, to be spent only on decarbonisation or development, based on its population. The net amount would be paid to or received from the fund. 'Keeping it simple & stupid' like this might spare us all the time wasting and cheating. It also addresses the problem in line with the science and respects equity in the carbon budget. The key outcome of this thought experiment is to illustrate the implications of action, and yes the fact that it would cost rich countries money (as it should). Running the numbers gives some surprising results though regarding the level of fees and dividends, especially when given as a percentage of GDP. All the data used comes from the World Bank excel sheets for GDP, population and global total carbon emissions. The following is based on 2009, the most recent year with data. The entire Excel spreadsheet I made is here with every country and region covered from 1964 to 2009. The total social cost of all emissions at $30/tCO2 would have been $961 billion [or $3,204billion for $100/tCO2]. Overall, the annual transfer from high income countries (almost all from OECD nations) would be $526billion [$1,755billion] or less than 1% [4%] of GDP. Poorer countries would receive the equivalent of 27% [90%] of GDP in annual development aid. There now, doesn't this plan spare us all these tedious UNFCCC meetings. Do I hear yowls of protest? Nope, I can't hear anything. Excellent. Motion carried! First, any regime is entirely is dependent on big assumptions in the social cost of carbon. If the SCC is $30/tCO2 then the annual damage is one trillion dollars our of a total GDP of $70trillion, about 1.4% per year. Or this rises to about 4.5% of GDP for $100/tCO2. The PAGE09 integrated assessment model run by Chris Hope at Cambridge University currently (in 2015) estimates a current SCC of $100/tCO2 rising to $125/tCO2 if tipping points are included. However, currently developed countries have only 'pledged' to 'mobilise' $100billion per year for developing countries, about a tenth of the $1 trillion per year (at $30/tCO2 SCC) cost of global emissions. One could say that the developed countries have priced the SCC at $3/tCO2. The difference between these values might be termed greed. Meanwhile fossil fuels subsidies are estimated by the IMF to total $1.9 trillion. Of course, if global warming were thought likely to cause total economic collapse to say a world GDP of $10 trillion per year for a hundred years after 2100 (a total loss of $6,000 trillion over the century, compared to current GDP) then for the sake of continuing civilisation, it might be worth spending pretty well all of global GDP ($6,000 trillion divided by 90 years is $66 trillion per year) to mitigate against that eventuality. Can the economists please guarantee this is not a real risk? It would be interesting to see their risk analyses. Second, the huge difficulties involved in administering, and especially in spending, the monies effectively, ringfenced to spending on decarbonisation and low-carbon development, can well be imagined. But how can a real global policy be effective at all without a serious scale of commitment from those countries who benefit most from the goods and services that cause emissions. And the alternatives? If, as all of the recent major reports acknowledge, it is necessary to leave 80% of all proven reserves of fossil fuels in the ground, the simplest solution would be to ensure that is what happens. Does anyone want a military taskforce to control all mines and wells, and dole out the allowed per-capita ration of carbon-bearing fuel? Might be the cheapest option? Thought not. The fact that the IEA and the World Bank, and governments of course, do not follow carbon budget logic through in their energy and GDP forecasts tells us all we need to know about how seriously policy analysts and governments treat the science. It seems increasingly likely that future generations, including our children, will pay the costs that rich nations, companies and individuals today are so keen to avoid currently. This blog aims to look at why we, as citizens and residents of Ireland, might want to start paying far more attention to climate change. All too often the challenge created by global warming is portrayed as only an environmental problem. It is not. It is a potentially deadly challenge to our future economic security and societal safety. Yet we can definitely affect outcome by our collective and individual decisions right now to reduce greenhouse emissions urgently and immediately. Climate change adds extraordinary danger and increasing risk to all of the future challenges we face if we do not act soon. We might want to start talking with each other about what we can do now to limit its effects and also make our political and business leaders aware of our concerns. One area of strong agreement is that acting early to limit the problem will be a great deal cheaper and easier than dealing with the problem down the line. The focus in these posts may wander, but it will concentrate on 'evidence' and 'response': on how to hold the line between these non-identical twins where they seem tangled; and also, on how to bridge the gap between science and policy when they appear to have drifted apart – creating misunderstandings and confusion. To make good decisions we need strong evidence from independent science, and to respond we need expertise from all fields and input from all citizens to create the policies that will truly address the scale of the challenge that is being revealed. So far internationally and here in Ireland, despite all the rhetoric and talk of action, the result has been the opposite of the supposed intention. Emissions have continued to increase massively, most of all due to consumption by the richest countries, people and businesses, especially in the developed nations. Ireland's emissions per person are amongst the highest in Europe. The brutal reality of climate change is simply that the climate does not care about our wishes for economic growth or delays in action. The atmosphere simply and implacably responds to the amount of greenhouse gases we throw into the air and oceans. We cannot negotiate with the atmosphere for a better rate or for extra time, much as we might wish otherwise. Smoking 'hopium' is not a good plan. Do we speak up in support of real action or do we continue to add to future problems for our children? Do we protect their property rights and human rights or do we contribute to taking them away? It is striking that climate change turns politics inside out. To be conservative we must act to limit the damage we create; to be revolutionary, all we have to do is not act so that the problem gets worse far faster. It is up to us then, here and now to make some hard choices: do nothing and steal from our children or act at a cost to ourselves. Here in Ireland we could start by being honest about the climate challenge we face and encourage each other and other nations to do the same. We can begin to do this by ensuring that the evidence provided by a 'science advisory expert body' is openly available, internationally reviewed, and kept completely separate from political or government influence. Our scientific advisory body must be entirely independent of government to ensure that real data and research is not obscured by economic or political preferences. Its reports need to be open to the public just as to government. Any policy response by expert advisors and government can then be acted on and judged against the publicly-available, best evidence from data and scientific research. As currently formulated the proposed climate bill for Ireland combines the science advisory with the economic and development policy advisors. This is a serious and dangerous error. It is a policy amounting to dishonesty, easily allowing policies for short-term, local gain to compromise real actions that would contribute to a global solution of this long-term problem. To show we are serious about reducing the risks we have to keep science and policy completely separate. This needs to be our basis to face climate reality squarely and honestly. Even if we decide to do little or nothing let's not set up an advisory that helps us to lie to ourselves. It may be difficult to face the truth but any other course increases risks to Ireland's future security and prosperity. Climate science says failure is not a smart option. We probably cannot adapt to what is coming, even during the lifetime of those born today the damages may overwhelm society. Optimistically though, we really can get off the current road to despair and onto a course for hope provided we do not continue to confuse ourselves by believing in rhetoric rather than looking hard at reality. The trouble is that we are running out of road. Honesty, in acknowledging the mounting danger that the evidence clearly shows we now face, is a vital first step that we all need to take.